The first ancient DNA study in South Asia has revealed that a 400-year-old bone relic kept in St. Augustinian Church in Goa is likely to be a remnant of Queen Ketevan of Georgia (eastern Europe), who was born in a royal family in 1565 in the medieval period. A team of investigators from the Centre for Cellular and Molecular Biology (CCMB), Archaeological Survey of India and Estonian BioCentre led by Dr. K. Thangaraj of CCMB traced that the relic, excavated from St. Augustinian Church complex in Goa, might belong to Georgian Queen Ketevan. The study has been published online recently in the journalMitochondrion. In the medieval period, Georgia was a vassal kingdom and the bone of contention between two mighty empires in West Asia — the Ottoman Turks and the Safavids in Persia. The former had suzerainty over the Western region and the latter over the Eastern region, the release said. During that period, entire Persia and its surrounding region was under control of emperor Shah Abbas I (1587-1629), who led an army to conquer Georgia and took Queen Ketevan as prisoner. For about a decade (1614 to 1624), the Queen remained in Shiraz as the prisoner of Shah Abbasi I. In 1624, the Persian emperor attempted to convert the Queen to Islamic faith. For resisting his wishes, she was tortured and strangled to death on September, 22, 1624. It said that as per literary evidences in Portuguese script, it was believed that in 1627 her right arm bone was brought to Goa by an Augustinian Frair and kept in a black box (stone sarcophagus) on the second window along the Epistle side of the chapel within the St. Augustinian convent at old Goa. 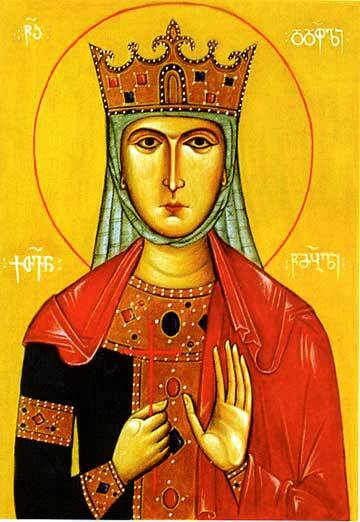 For almost 400 years, the remains of Georgian Queen Ketevan remained undisturbed somewhere in the convent, the release said. Considering the patriotic nature of Queen Ketevan, the Georgian Government approached the Indian Government to search for the relic of the Queen. Since 1989, various delegations from Georgia visited India and have worked together with the Archaeological Survey of India and tried to locate the relic within the ruins of St. Augustinian convent in old Goa. After several attempts and a topographical survey within the Augustinian church, the window mentioned in literary sources was located by archaeologists of ASI Goa circle assisted by a Portuguese student in May 2004. “During the excavation, we identified the bone relic, but the evidence could not be considered conclusive, therefore we approached CCMB, Hyderabad for ancient DNA study, said Dr. Nizamuddin Taher of ASI. CCMB scientists have isolated DNA from the bone and sequenced selected region of the mitochondrial DNA. Based on the sequence variation in the mitochondrial DNA, they have assigned a haplogroup called ‘U1b’ to the bone sample. “In order to find the distribution of U1b haplogroup in India, we have surveyed mitochondrial DNA sequence of 22,000 individuals from the sub-continent but none of them belongs to U1b haplogroup. However, two out of 30 Georgians, analysed have the same haplogroup, suggesting that the bone excavated in Goa is likely to be the remnant of Queen Ketevan of Georgia”, said Dr. K. Thangaraj. CCMB director, Dr. Ch. Mohan Rao said the excellent power of collaboration in the fields of history, archaeology and genetics helped in solving the historical problem. Setting up the state-of the-art facilities with cutting-edge technologies would greatly help in solving such scientific mysteries, he added. This entry was posted in Featured News, News and tagged CCMB, DNA, Georgia, Georgian Queen, Queen Ketevan by OCP. Bookmark the permalink.